This is slightly off topic, but we think it's worth it. 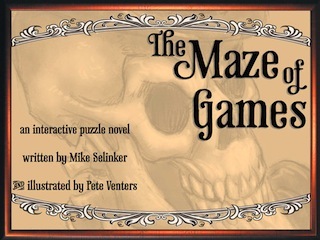 We want to introduce you to something very special: The Maze of Games, an interactive puzzle novel by acclaimed puzzle creator (and Puzzazz author) Mike Selinker. While there have been stories and novels with puzzles before (in fact, we publish a book full of puzzle mystery stories), The Maze of Games is a wonderful, unique breed -- a full-length novel with 50 puzzles in what Mike calls a "solve your own adventure" style, where the story and puzzles are delightfully intertwined. Nobody has ever created a book like this before. But it gets better. 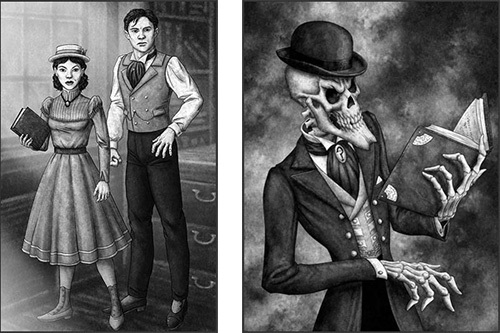 Set in 1897, the book features numerous great periodesque illustrations by Pete Venters, who is well known for his work on Magic: The Gathering cards. Puzzazz is extremely proud to say that we will be producing the ebook version of The Maze of Games. Like everything we sell at Puzzazz, every puzzle will be completely interactive, including the ability to write on the screen using our TouchWrite handwriting recognition. Even better, the ebook will also include the complete text and Pete Venters illustrations, so you can get the full experience on your digital device. Puzzazz is the only company with the technology to produce an ebook like this, and we're happy we can help bring Mike's lovely creation to more people. Mike's company, Lone Shark Games, is currently running a Kickstarter campaign for The Maze of Games and we strongly encourage you to check it out. If you need a quick puzzle fix, Mike's put some puzzles inside his campaign too. We are mighty proud to have Puzzazz do our ebook.